If you are an educator please visit our Educators page for information on promoting healthy eating in schools, or the Child Care Providers page for resources on creating supportive nutrition environments. All parents and caregivers want the best for their children when it comes to healthy eating. Understanding your child’s nutrition needs and what to expect at different stages is the first step to feeding children in a healthy and happy way. Your younger child will eat best when they learn to eat when they are hungry and stop eating when they are feeling full. You can help your child learn healthy eating habits by knowing what your role is at meals and snacks, and letting your child do their job. As a parent or caregiver, you still have a mealtime role with your youth. As youth get older, they are able to take on more responsibility at meal times. Provide them with opportunities to be creative with meals and snacks to increase their confidence and ability in the kitchen. Involve them in meal and snack planning and preparation, grocery shopping, cooking and gardening. * Add vegetables and fruit to each meal. Have them available as ‘grab and go’ snacks. * Children younger than 2 years old need full-fat homogenized milk, if breastmilk is no longer their main source of milk. After 2 years of age, offer 1% or 2% milk or unsweetened fortified soy beverage. ABCs of Packing a School Lunch with a Punch! Drinks such as energy drinks, sports drinks, pop, iced tea, lemonade and other fruit drinks are high in sugar. Some are also have caffeine. Energy drinks are not recommended for children and youth and other sugary drinks should be kept as a “sometimes” choice. 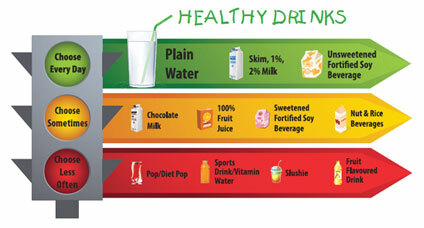 Sugary drinks bump out healthy choices like water, milk, or unsweetened fortified soy beverage. These healthy choices are important for healthy growth and development. Choose water to quench thirst in between meals and snacks. 100% fruit juice has a lot of natural sugar. Enjoy a whole piece of fruit instead. If you do offer juice, offer 100% fruit juice and limit to 125–175 mL (½–¾ cup) per day. Children learn about food by watching others and are more likely to eat new foods when they see adults and other children eating and enjoying them. Be mindful of what you eat and say about food around children. When children see adults eating well, enjoying physical activity, and feeling good about themselves, they are more likely to display these behaviours. Never use food to reward, punish, or comfort your child. This can lead to children eating to feel a certain way, and may teach children to prefer some foods over others. Use meals as a time for your family to gather and reconnect. Encourage children to try a variety of foods, and use this opportunity to role model healthy behaviours. Children who help plan, prepare and cook meals at home are more likely build healthy eating habits and eat the foods they helped prepare. Involve children and youth in grocery shopping, meal planning, cooking and even gardening! While you are in the kitchen, at the dinner table or cleaning up after a meal, take advantage of the many learning opportunities. Visit UnlockFood.ca for recipes, tips for cooking with kids, “how-to” videos and more. Breastmilk can continue to be an important source of nutrients for younger children. Continue breastfeeding for up to 2 years and beyond, or for as long as you and your child want. If your child is breastfeeding and less than 2 years old, Health Canada recommends they take a vitamin D supplement each day. Children need at least 500mL (2 cups) of milk each day. Avoid offering more than 750mL (3 cups) of milk as too much milk can bump out other healthy foods. Children younger than 2 years need full-fat homogenized milk, if breastmilk is no longer their main source of milk. After 2 years of age, offer 1% or 2% milk or unsweetened fortified soy beverage. Serve milk and other drinks in an open cup, not in a bottle. Don’t restrict fat. Nutritious higher-fat foods like peanut butter and cheese can help younger children meet their energy and nutrient needs. Foods that are high in fat, sugar and/or salt, and low in vitamins and minerals (such as: cookies, chips, sugary drinks) should be limited as they bump out more nutritious foods. Situation: Your child wants the same food every day, or refuses to try new foods. What You Can Do: At times, children may be less open to trying new foods. Offer nutritious foods your child likes along with other healthy choices. You may need to offer a new food 10–15 times before your child will taste it. Be patient and don’t pressure your child to eat. Situation: Your child takes too long to eat. What You Can Do: Give your child time to explore, touch and taste their food. Serve small portions as large amounts can be overwhelming. Offer more if your child is still hungry. After about 20–30 minutes, remove your child’s plate without a fuss. Situation: Your child refuses to eat. What You Can Do: Respect your child’s appetite; it can vary from day to day and meal to meal. They may eat a lot one day and a little another day. Avoid becoming a short-order cook. Healthy children may skip meals once in a while. Avoid foods that are hard, round and small, and smooth and sticky like popcorn, thick peanut butter, nuts and seeds, marshmallows, fish with bones, snacks with toothpicks/skewers, hard candies, chewing gum. NutriSTEP® is a simple questionnaire that looks at your toddler’s (18–35 months) or preschooler’s (3–5 years) eating and physical activity habits. It’s a no-cost questionnaire that offers helpful tips for the whole family on healthy growth, cooking, feeding and mealtimes, meal planning, physical activity and more! If you’re a service provider and looking for more information on using NutriSTEP® with the families you work with, you can call 1-800-660-5853 or visit http://www.nutristep.ca/.